Each order contains one pair of socks. Each tube sock will be printed with your design on the outside of the sock. The inside tubes of the socks that face one another when worn will be left blank. Your design will naturally stretch with the socks when worn. We suggest bold, blocky designs and text for better legibility and overall maximum design awesomeness. These sporty striped socks are perfect for everyday use. Wear them at your next sports game, race, school event, or when you're lounging around the house. Approximate leg length when worn is 16.25"
PLEASE NOTE: Your design will stretch with the sock when worn. We suggest bold, blocky designs and text for better legibility. PLEASE NOTE: We recommend hand washing these socks. It's not St. Patrick's day without green apparel or green beer! 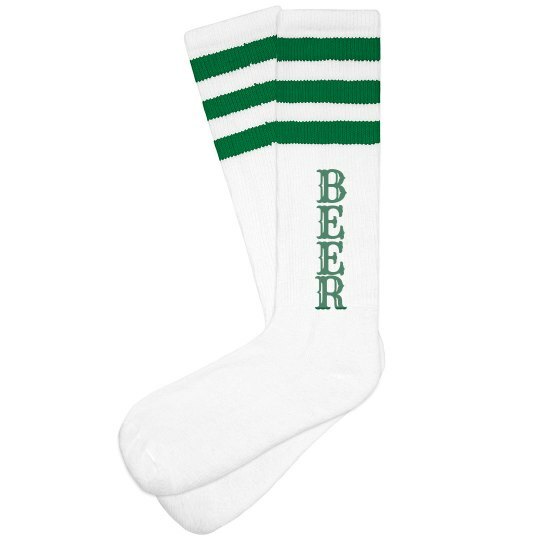 Get these cute and trendy knee high socks to wear while you day drink on March 17th. Great for waitresses and bartenders to wear while serving at the pub!